Our second meeting of Real Dharma Meditation & Inquiry was full and empty at the same time—filled with sincere and profound inquiry, empty of clinging and false conceptions. What could be better than that? There were more folks than last time—some new faces and some familiar ones. The meditation was, again, very deep and still. 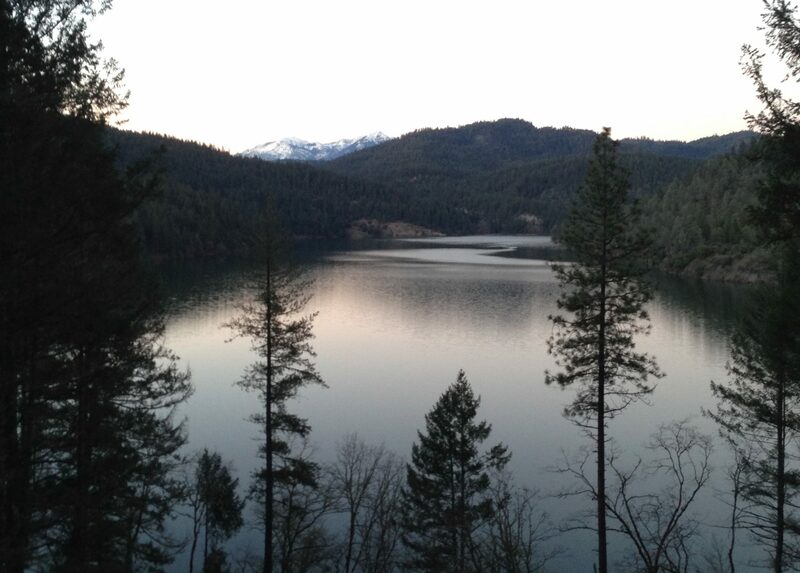 After meditation, and before I could even begin speaking, there was a question about emptiness versus fullness, as taught in Buddhism and Advaita Vedanta. This sync’ed nicely with the Milarepa quote I recently posted here and that I had been contemplating, and it led to a discussion of the Buddhist teaching of emptiness as not being a mere absence. Emptiness reveals one’s true nature to be Buddha Nature. What are absent are false concepts and elaborations that obscure Buddha Nature. This freedom from false concepts is indicated by the Sanskrit term nisprapanca (free from concept or conceptual elaboration), a term that appears in the Pali canon, as well as in Mahayana teachings. Although free from concepts, one’s true nature can be described in positive terms, as well as in terms of emptiness or non-self. For example, Buddha Nature has been called wisdom (jnana [Skt. ]or yeshe [Tib.]) and Clear Light Awareness. And it has the qualities of natural love and compassion. This Buddha Nature is our true nature, already fully present, even if obscured by temporary afflictions. For most of the evening we discussed Buddha nature and meditation, as well as other topics. The questions continued spontaneously and without ceasing, leading to interesting, challenging and meaningful discussion and inquiry. This was a lot of fun—much more lively and interesting than hearing me give a boring old lecture! Everyone seemed very engaged. And throughout the inquiry, there was a tangible sense of stillness, seriousness, care and even, dare I say, love, coming from all participants. This made the inquiry very real, and not merely intellectual. One thing that struck me was how our investigation and discovery were not bound by any particular dogma or belief system. Ancient rivalries such as that between Buddhism and Vedanta are not really relevant here in the West, particularly if one’s intention is to find liberation, rather than to cling to or promulgate a belief system. That doesn’t mean one should be haphazard or dilettantish in pursuing one’s path. Lineage still holds an important place. And so does depth and clarity. But in the end, the realization of one’s true nature takes one beyond all words, sects and dogmas. I am once again struck by our new group’s sincerity and depth and intelligence. And I’m grateful to be part of it. I think these are the blessings of the wisdom and practice lineage in action. We had our first meeting of the Real Dharma group for meditation and inquiry in Fairfax, CA on Tuesday and, I’m happy to say, a good time was had by all. A small group of about 10 sincere, smart and fun folks showed up. We sat for about 1/2 hour, I gave a talk for about 1/2 hour, and then we had questions, answers and discussion for about 1/2 hour. 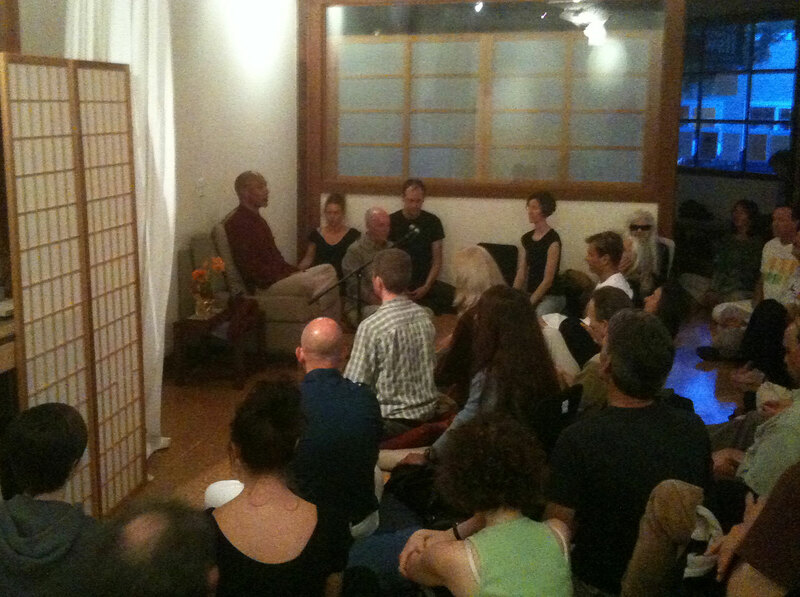 Everyone said the meditation was very deep and that it was great to sit together. One person asked why it seemed so much more powerful to sit together in a group than alone, and if this sense of greater depth together was real. I had to admit I don’t really know why it is so, but that it was tangible and unmistakably real. Each of these points deserve their own post, so I’ll elaborate more later. But “Buddhism without baggage” means, to me, an approach to the essential truths of Buddhism that emphasizes direct awakening and liberation, and that does not rely too much on dogma, ritual or cultural accretions that Buddhism has accumulated in its long journey through many countries and cultures. And Real Dharma is a “guru free zone” because nobody is viewed as special or superhuman, and there is no need for authoritarianism, obedience or blind faith. Rather, liberation is seen as attainable by ordinary human beings, and each person is encouraged to inquire, question and realize liberation for him or herself. There were lots of good questions and the feeling was intimate and very real. I think we’re off to a great start. Our next meeting is Tuesday, June 8, 2010 at 7:30 p.m. See “Events” for the location. On Tuesday, June 22, 2010, we are honored and pleased to have Anam Thubten of Dharmata Foundation as a special guest speaker. I’ll announce more about that later. 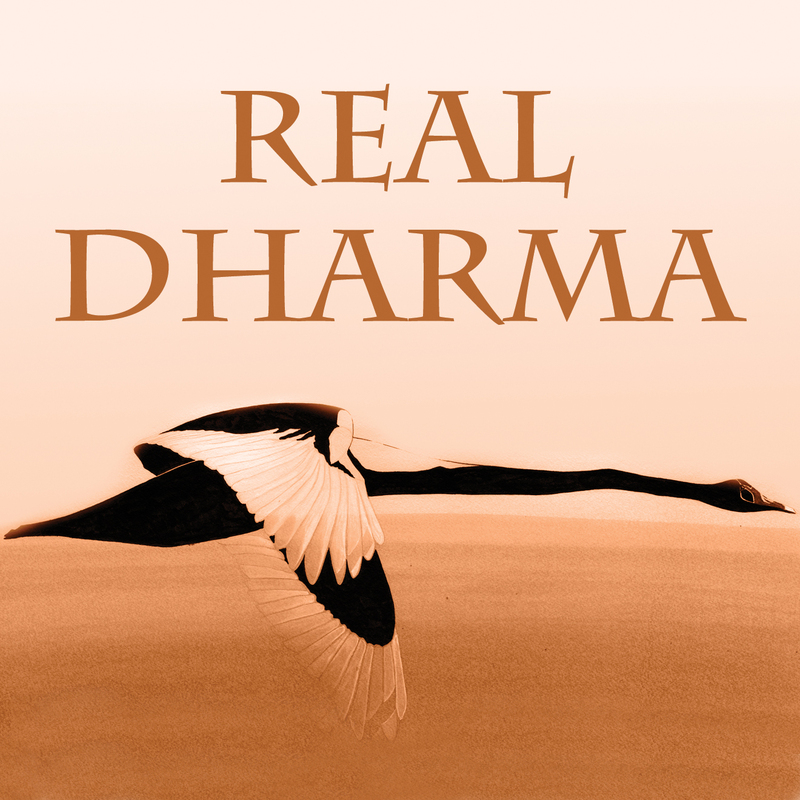 I hope to see some of you at our next Real Dharma meeting.